Today's challenge is to be inspired by a theme park/ride. My fave ride EVER is the Spiderman ride at Universal Studios Orlando. It's so awesome, I'll ride it multiple times in a row. It's so awesome that one time I rode it some of the projectors were broken, and we got to see a little bit of how the magic worked. And I still loved it. I started out with the top half of my nails painted with Liquid Sky Lacquer Tripindicular, a red holo, and the lower half with Born Pretty Holo #8, a blue holo. ...and stamped some bugs? Well, they're definitely not spiders because they only have 6 legs, not 8. Dammit. At least the webs I drew on let you know it's supposed to be spiders, right? 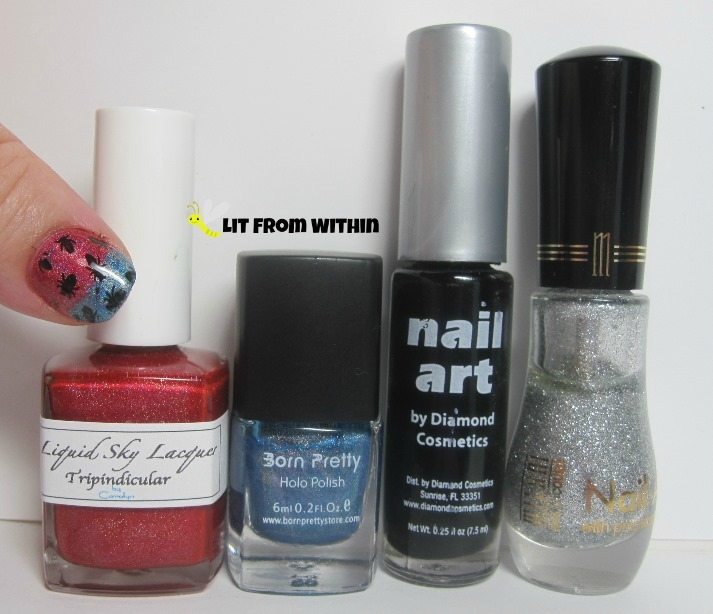 Bottle shot Liquid Sky Lacquers Tripindicular, Born Pretty Holo #8, and stripers in black and silver glitter. 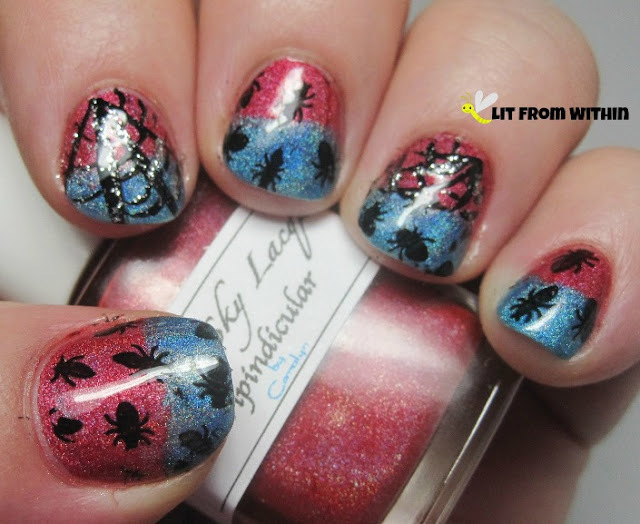 If you'd like more information about Liquid Sky Lacquer, you can find them on Facebook, and their Big Cartel store. 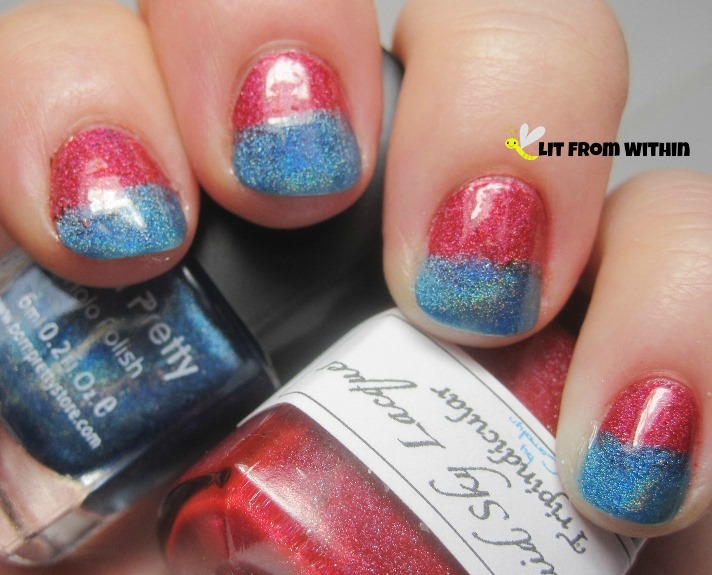 Born Pretty Holos are from the store that has tons of polish and nail art supplies, Born Pretty Store. Fun manicure inspired by your first ride! Thanks, Lisa! I wish it could have captured the wonderfulness that is the Spiderman ride. lol! 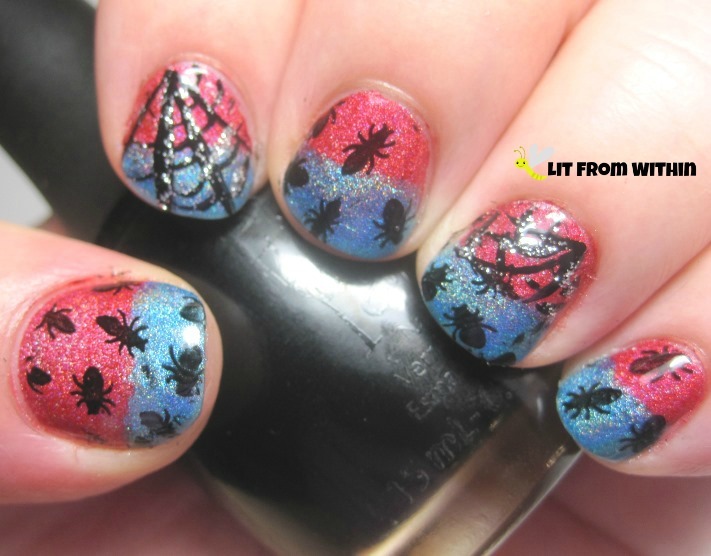 I think holos was a good choice for this mani :) represented spiderman well! That's cool! Holos are so awesome. Thanks!! I did think about it for a second. I don't think I'm *that* steady with the brush, though! I would have made such a mess. lol! Squashed spiders! Is there a Spiderman Rollercoaster?